There are two ways to add BlackBerry Bridge, the connecting software that comes with your Blackberry Playbook, to a BlackBerry smartphone; neither requires heavy lifting and both are free. And there are two times when it can be done: during the initial configuration of your BlackBerry PlayBook or after it is up and running. The process is similar in either situation, with slightly different onscreen guidance. Skip the BlackBerry Bridge configuration when you first set up your tablet and come back to it later once the BlackBerry PlayBook is up and running. It’s just a little bit simpler to do it on an already-configured tablet. From the PlayBook’s home screen tap the gear icon to display the panel of controls. Give your PlayBook a name. Don’t call it PlayBook, because sooner or later you’re going to be in a room with more than one BlackBerry tablet. 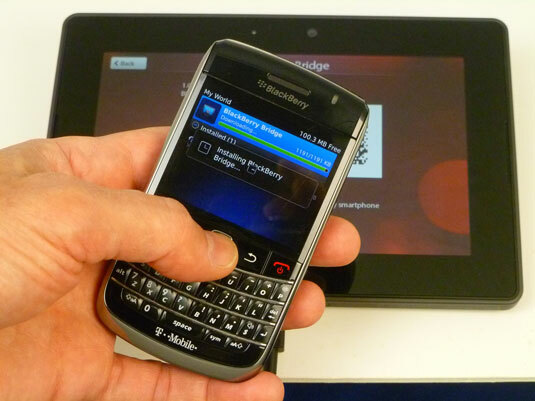 A copy of the BlackBerry Bridge app to your BlackBerry smartphone starts downloading. Put down your PlayBook and pick up your BlackBerry smartphone. Go to the BlackBerry App World icon on the phone and connect to RIM’s store. You need a data plan with your cellular provider in order to connect your BlackBerry smartphone to BlackBerry App World for downloading. Make sure you understand data charges associated with that plan and be aware that costs can be very high if you’re roaming away from your provider — especially if you’re in a foreign country. 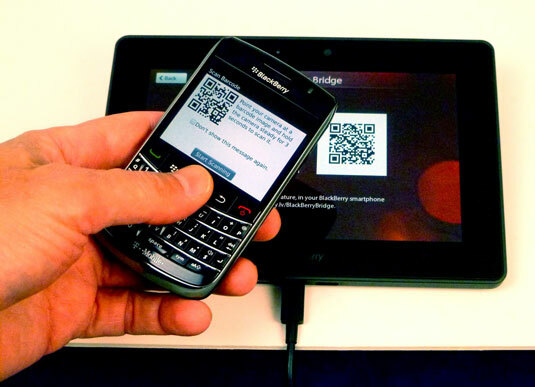 With the BlackBerry App World open on your phone, press the menu key and click Scan a Barcode. The built-in camera comes to life. Point the camera lens (on the side away from the keypad) at the barcode that appears on the PlayBook’s screen. Hold the phone a few inches away and keep it steady for a couple seconds to allow the phone to autofocus on the barcode and recognize it. 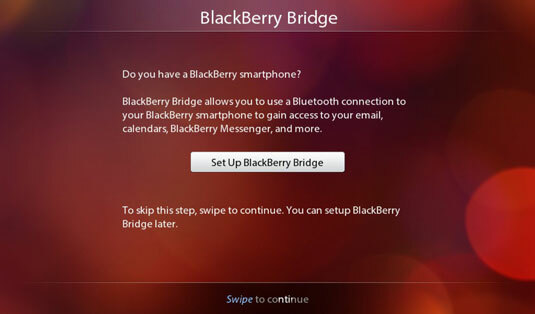 The phone will now understand that you want to download BlackBerry Bridge and do so. Go to BlackBerry App World on your BlackBerry smartphone. 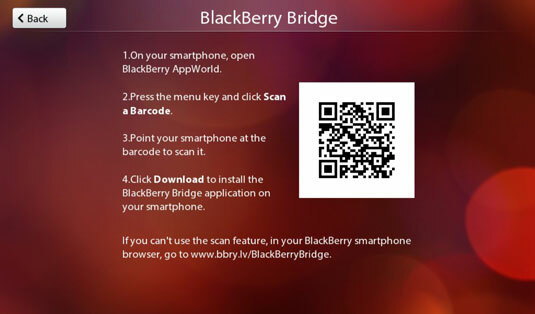 Download BlackBerry Bridge to your phone.